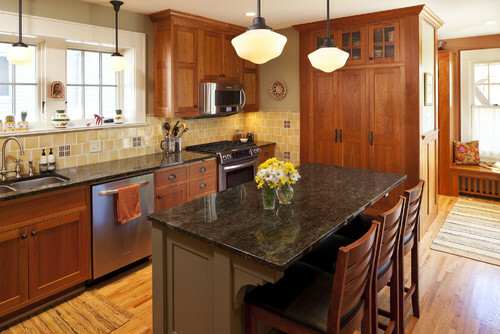 The Granite Gurus: FAQ Friday: What Granite Goes With Oak Cabinets & Maple Floors? 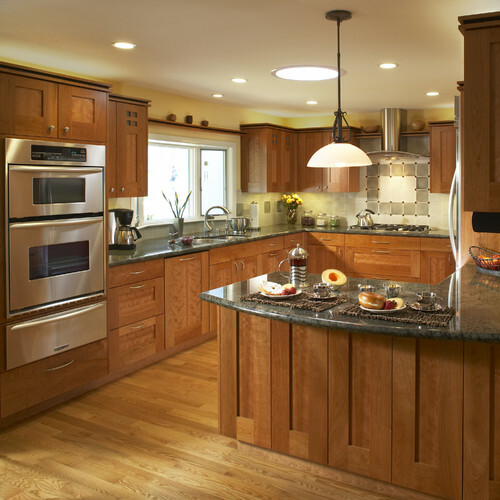 FAQ Friday: What Granite Goes With Oak Cabinets & Maple Floors? "Your blog is awesome. 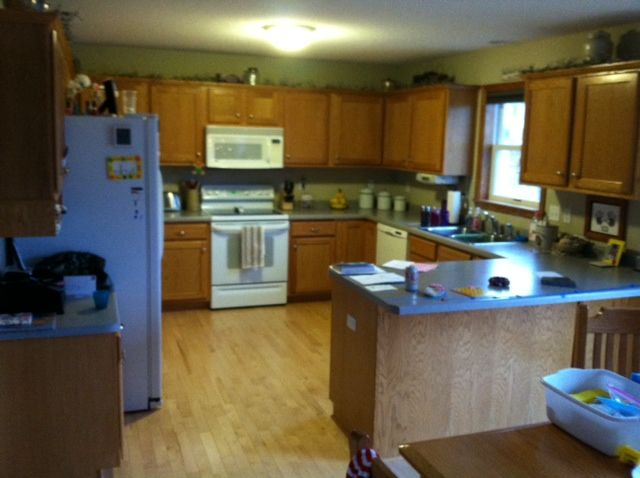 I'd love a little advice and/or reader voting on what color granite we should use with our kitchen project. We live in a very "normal" house with a very "normal" kitchen. We don't have a ton of light so we are afraid of going too dark, but we obviously need a little contrast with the maple floors and light/medium oak cabinets. What do you think? Seriously, we've kicked around tropical brown, coffee brown, giallo portofino, st. cecelia, opalescence, mesabi black, and new venetian gold (to name a few)!!" Thanks for the email Matt. I would recommend not going with the gold toned granite colors, this will only make your kitchen too golden. So I'd stay away from the Venetian Gold, Giallo Portofino & Santa Cecilia. Instead look for something with contrast, whether it's dark or light. You seem to be leaning on the darker side. I think the Tropic Brown, Coffee Brown and Opalescence would all give you a good contrast without being too dark. Your kitchen doesn't look overly dark to me at all, so I wouldn't worry about using a dark color. I hope these pictures help Matt! Now, reader's do any of you have any great suggestions and/or photos to help Matt? If so, leave them in the comments here. I think Tropic Brown, Tan Brown or English Brown would all be pretty. I agree with Steph, you need contrast, so the dark would be good. My last home looked similar to this, same wood colors. I knew I needed contast, so I did lighter. I did a white CaesarStone, Blizzard. I loved it. I have Absolute Black in my kitchen, same colored cabinets. Wouldn't change it. Looking at these pictures I really like the green. Definitely don't do anything gold! I agree with Steph, go darker. I'd do a black or the browns with black like Tropic Brown. The Ubatuba may be pretty as well. I'd suggest Cafe Imperial granite. I work at a slab yard in Maryland and it's a color that is so beautiful and no one really uses it lately. Also Brown Antique would be beutiful in your kitchen. I agree with Daphne, Brown Antique would be gorgeous! I love that color. 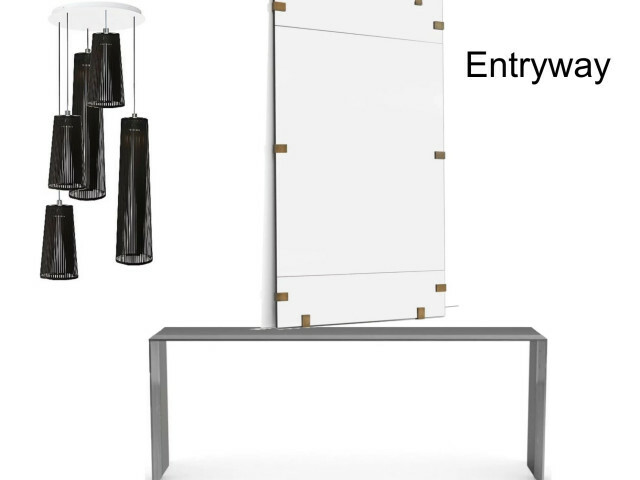 You definitely need a contrast, Brown Antique would be great.